The last of the bridge centennial parades was held on Wednesday, May 12, 2010. The Madison Avenue Bridge spans the Harlem River and connects Manhattan with the Bronx. 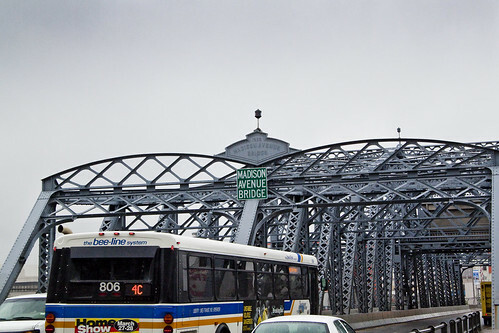 The Madison Avenue Bridge crosses the Harlem River connecting Madison Avenue in Manhattan with East 138th Street in the Bronx in New York City. The bridge is operated and maintained by the New York City Department of Transportation. It was designed by Alfred P. Boller and built in 1910 to replace and double the capacity of another earlier swing bridge dating from 1884. It rained, at this parade. 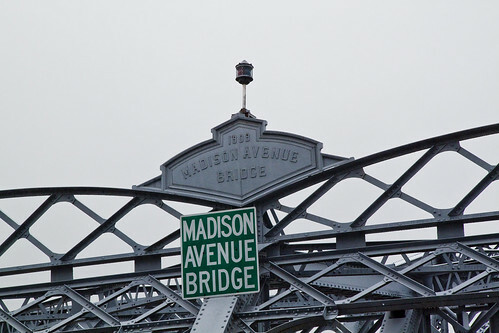 The Madison Avenue Bridge, which today is maintained by the New York City Department of Transportation (NYCDOT), provides two lanes of eastbound and two lanes of westbound traffic between Manhattan and the Bronx. On the Bronx approach, the bridge directly connects to the Major Deegan Expressway (at EXIT 3). On the Manhattan approach, motorists must take side streets to connect to the Harlem River Drive. 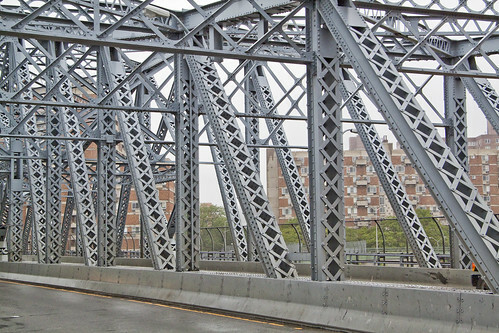 According to the NYCDOT, the bridge carries approximately 45,000 vehicles per day (AADT). 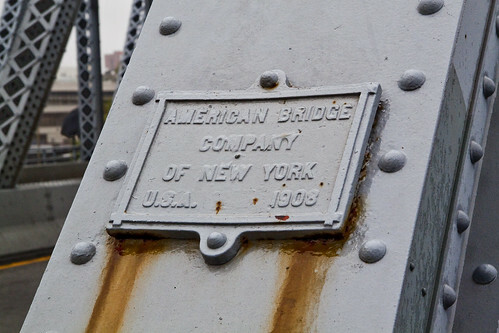 American Bridge Company? That was J.P. Morgan, wasn’t it? The Harlem River is a navigable tidal strait in New York City, USA that flows 8 miles (13 km) between the Hudson River and the East River, separating the boroughs of Manhattan and the Bronx. Part of the current course of the Harlem River is the Harlem River Ship Canal, which runs somewhat south of the former course of the river, isolating a small portion of Manhattan (Marble Hill) on the Bronx side of the river. The indomitable DOT crew that provided electricity and made sure that tents were in place to shield the dignitaries and speakers from the weather. Notice their high visibility safety gear. The New York City Department of Transportation (NYCDOT or DOT) is responsible for the management of much of New York City’s transportation infrastructure. Janette Sadik-Khan is the current Commissioner of the Department of Transportation, and was appointed by Mayor Michael Bloomberg on April 27, 2007. The department’s responsibilities include day-to-day maintenance of the city’s streets, highways, bridges and sidewalks. The Department of Transportation is also responsible for installing and maintaining the city’s street signs, traffic signals and street lights. The DOT supervises street resurfacing, pothole repair, parking meter installation and maintenance, and the management of a citywide network of municipal parking facilities. The DOT also operates the Staten Island Ferry. The bridge itself is a rather straightforward swing bridge, with trusses and box girders forming the superstructure for the busy roadway. Cake is a form of food that is usually sweet and often baked. Cakes normally combine some kind of flour, a sweetening agent (commonly sugar), a binding agent (generally egg, though gluten or starch are often used by lacto-vegetarians and vegans), fats (usually butter, shortening, or margarine, although a fruit purée such as applesauce is sometimes substituted to avoid using fat), a liquid (milk, water or fruit juice), flavors and some form of leavening agent (such as yeast or baking powder), though many cakes lack these ingredients and instead rely on air bubbles in the dough to expand and cause the cake to rise. Cake is often frosted with buttercream or marzipan, and finished with piped borders and crystallized fruit. All Politicians love cakes and cameras, and are magnetically attracted to them from wherever they may be in the city. To balance local authority along with the centralization of government, the Office of Borough President was established with a functional administrative role derived by having a vote on the New York City Board of Estimate, which was responsible for creating and approving the city’s budget and proposals for land use. The Board of Estimate consisted of the Mayor, the Comptroller and the President of the New York City Council, each of whom were elected citywide and had two votes, and the five Borough presidents, each having one vote. In 1989, the Supreme Court of the United States, in Board of Estimate of City of New York v. Morris (489 U.S. 688) declared the New York City Board of Estimate unconstitutional on the grounds that the city’s most populous borough (Brooklyn) had no greater effective representation on the board than the city’s least populous borough (Staten Island), this arrangement being an unconstitutional violation of the Fourteenth Amendment’s Equal Protection Clause pursuant to the high court’s 1964 “one man, one vote” decision. The city charter was revised in 1990 and the Board of Estimate was abolished. The Office of Borough President was retained but with greatly reduced power. The borough budget reverted to the mayor or the New York City Council. A Borough President has a small discretionary budget to spend on projects within the borough. The last significant power of the borough presidents — to appoint a member of the New York City Board of Education — was abolished, with the board, on June 30, 2002. The two major remaining appointments of a Borough President are one member of the city Planning Commission and one member of the Panel for Educational Policy. Borough Presidents generally adopt specific projects to promote while in office; but, since 1990, Borough Presidents have been seen mainly as the ceremonial leaders of their boroughs. Officially, they advise the Mayor on issues relating to each borough, comment on all land-use items in their borough, advocate borough needs in the annual municipal budget process, appoint Community Boards, chair the Borough Boards, and serve as ex officio members of various boards and committees They generally act as advocates of their boroughs at the mayoral agencies, the city council, the New York State government, public corporations and private businesses. Borough President of Manhattan Scott Stringer arrived first, and seemed pleased with the confection. 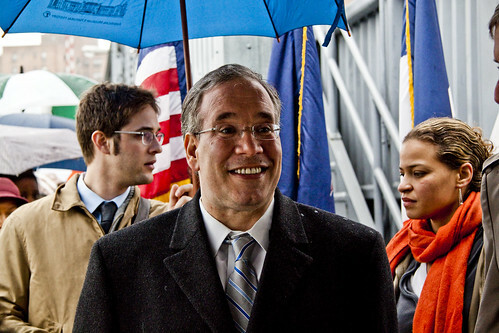 Scott Stringer (born 1960) is a New York Democratic politician and the current Borough President of Manhattan. His mother, Arlene Stringer-Cuevas, is a cousin of Bella Abzug and served on the New York City Council. Stringer grew up in the Washington Heights/Lower Inwood neighborhood of Upper Manhattan, attended Manhattan public schools and graduated from the John Jay College of Criminal Justice. In 1983, he became a legislative assistant to Assemblyman, and future Congressman, Jerrold Nadler. During these years, he supported Democratic candidates such as Governor Mario Cuomo. In 1992, Stringer ran for Nadler’s Assembly seat representing the Upper West Side when Nadler replaced deceased Congressman Ted Weiss. 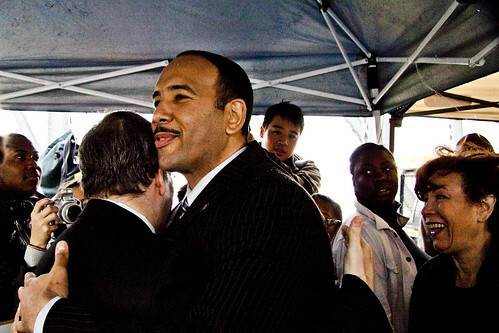 Bronx Borough President Ruben Diaz, Jr. arrived in a nearly simultaneous fashion, and the two exchanged pleasantries- while eyeing the pastry. 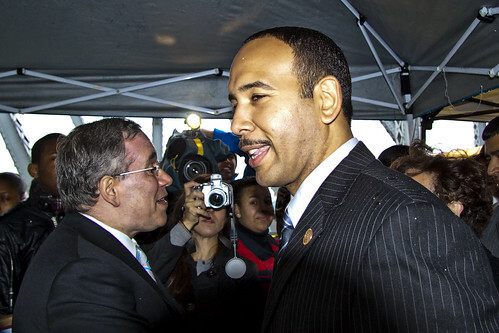 Ruben Diaz, Jr. (born April 26, 1973) is a Democratic Party politician from the Bronx in New York City, and the son of New York State Senator Rubén Díaz. 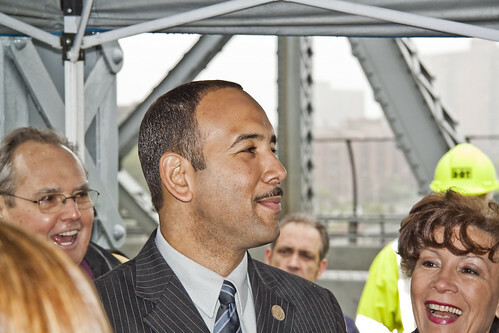 Diaz became the Bronx Borough President in April 2009 after representing the 85th Assembly District in the New York State Assembly. When first elected in 1996 he became, at age 23, the youngest member of the New York State Legislature since Theodore Roosevelt. The two BP’s electrified the crowd of well wishers, reporters, and invited guests. Diaz also maintained a certain vigil on the cake. 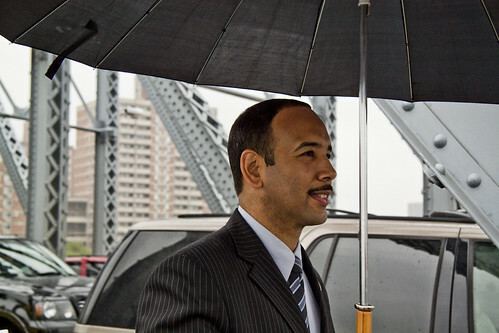 On February 18, 2009, U.S. President Barack Obama appointed Bronx Borough President Adolfo Carrión, Jr. to the position of Director of the White House Office on Urban Affairs. 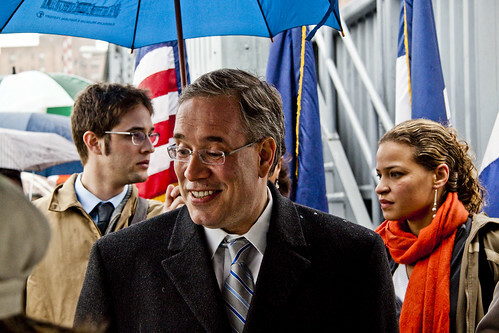 When Mayor Michael Bloomberg declared a special election to choose his successor, Diaz was considered the leading candidate for the position of Bronx Borough President. The special election was held on April 21, 2009. Diaz defeated Republican Party candidate Anthony Ribustello by an overwhelming 87% of the vote, to become the 13th Borough President of the Bronx. On July 1, 2009 Diaz appointed Delores Fernandez to the reconstituted New York City Board of Education. Fernandez is anticipated to be the sole member of the Board that will have a perspective independent of mayor Michael Bloomberg. Diaz ended his first summer as borough president by recommending that the New York City Council reject Related Companies’ proposal to turn the Kingsbridge Armory into a shopping mall. In an editorial in the New York Daily News, Diaz wrote he is “fighting to make sure that this development includes ‘living wage’ jobs that offer health insurance.” Related’s proposal is still going through the city’s review process. The ceremonies began with the national anthem as sung by members of (I believe) the Choir Academy of Harlem. Samuel I. Schwartz, a.k.a. Gridlock Sam, is one of the leading transportation engineers in the United States, and is widely believed to be the man responsible for popularizing the phrase gridlock. Educated at Brooklyn College and the University of Pennsylvania, he originally worked as a cabbie. 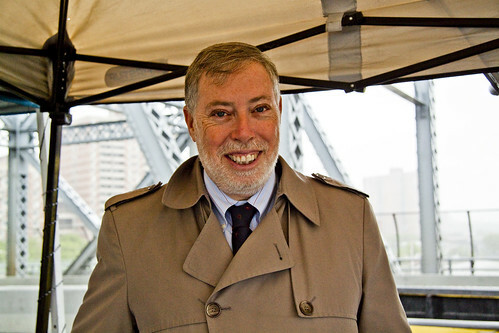 He eventually held the second-in-command post of Deputy Commissioner in New York City’s transportation department for many years and now operates as a private consultant. One of Gridlock Sam’s newest developments is that of a plan to enhance truck traffic along the Detroit-Windsor border. Today he gives advice in his own column in New York City’s Daily News. He answers questions by mail and alerts readers about traffic patterns. Master of ceremonies Sam Schwartz. Some thirty-seven years ago I began my professional career as a New York City taxi driver. This provided basic training for maneuvering through the city’s streets. Though trained in science, I switched majors to transportation engineering in graduate school. I thought I would save the subways, but the Transit Authority wouldn’t offer me a job. I ended up as a junior engineer at the old Traffic Department. Initially I worked developing neighborhood one-way plans but soon I was moved to “Special Projects”. John Lindsay was mayor and proposed many innovative and bold schemes to reduce traffic in Midtown. I spent a lot of time on these plans, working with an old-time traffic engineer named Roy Cottam. One day, Roy spoke of his fears if we closed the streets in the Theater District, the grid system would “lock-up” and all traffic would grind to a halt. Soon we simply juxtaposed the word, and the term gridlock was born. There was a general feeling of happiness, despite the wet and cold. Of course, we were all under the tent. 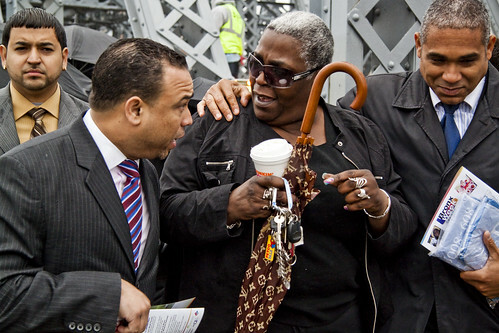 In the spring of 2007, a group of civic minded individuals realized that several of New York City’s bridges were approaching their 100th anniversary. In order to commemorate the significance of these magnificent spans and their role in making New York City the greatest metropolis in the world, the group formed the NYC Bridge Centennial Commission, a 501 (c) 3 corporation. 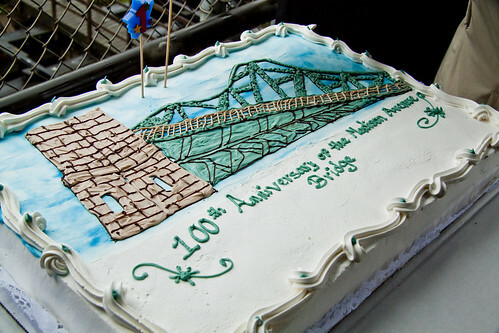 The aim of the Commission is to promote the 100th year anniversary of six historic New York City bridges, to educate the public about the bridges’ role in the life of the city, to encourage respect for the history of New York City; to heighten the public’s awareness of the City’s infrastructure and the need to maintain it; and to stimulate the interest of the public in celebrating the centennial of these six bridges. Out of nowhere, the Kevin C. Kane, NYFD Marine 6 appeared. Kevin C. Kane, N2MEI, was a New York City Firefighter, and a member of LI-MARC. Early on the morning of September 12, 1991, Kevin responded with Engine Com-pany 236 to a fire in at an abandoned apartment house in the East New York section of Brooklyn. Despite the knowledge that there might not be enough hose to reach all parts of the house, Kevin and his fellow firefighters entered the building in search of victims. Shortly thereafter, a section of burning ceiling fell on Kevin. Despite the frantic efforts of his colleagues, they were not able to reach him. Eventually he managed to jump from a window, into the bucket of a fire truck. Having been burned over most of his body, he died the next day. 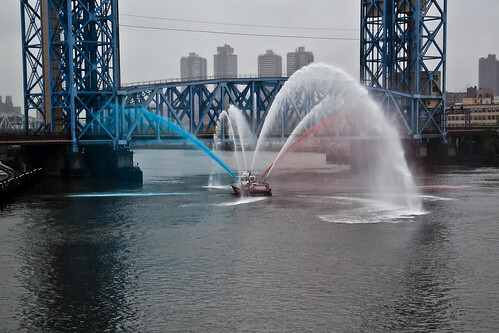 In his honor, The NYFD named a fireboat The Kevin C. Kane, and created the Kevin C. Kane Medal for bravery. The kids from the Harry S Truman High School band, and I mean all of them, were just jumping with personality and enthusiasm. 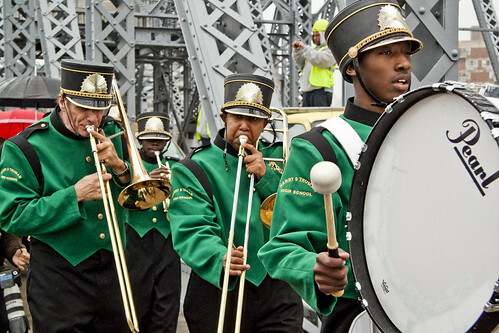 Marching band is a sport consisting of a group of instrumental musicians and usually dance teams / color guard who generally perform outdoors and incorporate some type of marching (and possibly onto other movements) with their musical performance. Instrumentation typically includes brass, woodwinds, and percussion instruments. Most marching bands use some kind of uniform (often of a military style) that include the school or organization’s name or symbol, shakos, pith helmets, feather plumes, gloves, and sometimes gauntlets, sashes, and/or capes. Suddenly, all the spectators were looking south while I was looking west. Harry S. Truman High School is a public high school at 750 Baychester Avenue, in the Bronx, New York City, United States. The school is designated as an Empowerment School by the New York City Department of Education, which allows it more autonomy in choosing a curriculum. Truman High School is one of the remaining large high schools in the Bronx that has not been broken up into a number of small schools. This trend which has been popular in the city has seen South Bronx High School, Evander Childs High School as well as Roosevelt High School split into a number of smaller schools that are still located in the same building. Truman High is located in the Co-op City section of the Bronx, yet many of the students commute to school from areas as far away as the South Bronx. The size of Truman High School (over 3000 students) does give it the benefit of having many sports programs and extracurricular activities. Marine 6 was starting its own performance. 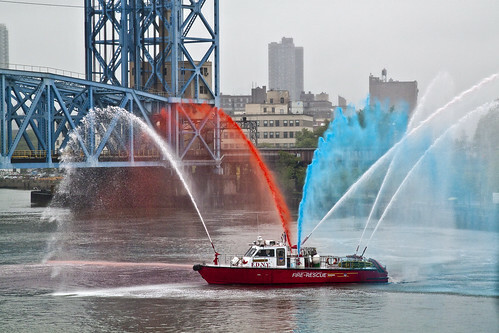 MARINE or Fireboat is a specialized boat outfitted specifically for firefighting capabilities. 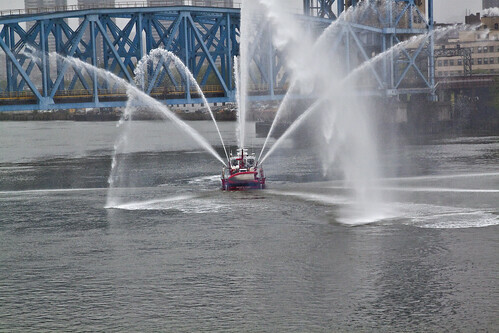 Its responsibilities include suppression of all fires that occur on water, such as boat fires, pier fires, etc. A Marine Unit also assists land based companies with securing a water supply, as they have the ability to “draft” water from the rivers they operate in. The first bridge on this site was constructed by the New York and Harlem Railroad in 1841. It was composed of four 90-foot (27 m)-long box truss spans, three of which were fixed iron spans, while the remaining span was a wooden swing span. In the closed position, the bridge had a clearance of only seven feet above mean high water. Masonry piers supported the four box-truss spans. In 1867, the wooden drawbridge was replaced with an iron one that gave a clearance of fifty feet. It was very busy. By the 1880s, the bridge was crossed by more than 200 trains a day. The bridge was soon made obsolete by heavy traffic and dredging of the Harlem River Ship Canal. Alfred P. Boller worked with the railroad to create a new four-tracked swing bridge. The railroad and the city split the cost. The new bridge was built in conjunction with the Army Corps of Engineers’ project to build the Harlem River Ship Canal. The Park Avenue railroad viaduct was also extended north of 115th Street at the same time. While the bridge was being built, a temporary bridge was built and the old span was demolished. When the new bridge was finished, it had a 300-foot (91 m)-long steel truss span supported by masonry piers. The new span had a vertical clearance of 25 feet (7.6 m). … and a patriotic display is manufactured. During the 1960’s and 1970’s, the Park Avenue Railroad Bridge passed through the hands of several financially ailing railroads, ranging from the New York, New Haven and Hartford Railroad to the Penn Central Railroad. Today, the lift span is operated by the MTA Metro-North passenger railroad. Recently, the MTA Metro-North Railroad announced a $10 million project to rehabilitate the Park Avenue Railroad Bridge. The bridge control, power and lift systems are now beyond their useful life, and will not be replaced. Instead, the project will remove the moveable elements of the bridge (such as the wire rope and counterweight), and will rehabilitate the foundation. 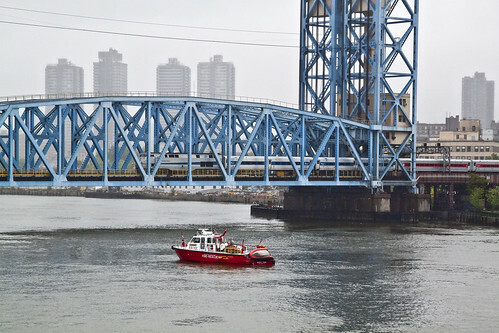 The MTA Metro-North Railroad currently is seeking approval from the U.S. Coast Guard to make this a fixed bridge in order to minimize the cost of rehabilitation. The announcement was made that the rest of the ceremony would be kicking off “Bronx Week”, so the entire crowd began to lurch toward the Bronx shoreline. In a marching band or a drum & bugle corps, the colorguard is a non-musical section that provides additional visual aspects to the performance. The marching band and colorguard performance generally takes place on a football field while the colorguard interprets the music that the marching band or drum & bugle corps is playing via the synchronized spinning of flags, sabres, rifles, or through dance. The color guard uses different colors and styles of flags to enhance the visual effect of the marching band as a whole. The number of members in a colorguard can vary- some only having a few members while others may have 41 or more. Within the band, colorguard is often referred to as flagline or simply guard. 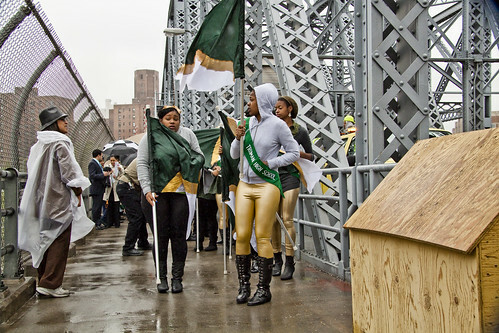 The Truman kids led the march off the Madison Avenue Bridge toward the Bronx side. The size and composition of a marching band can vary greatly. Some bands have fewer than twenty members, and some have over 500. American marching bands vary considerably in their instrumentation. Some bands omit some or all woodwinds, but it is not uncommon to see piccolos, flutes, clarinets, alto saxophones, and tenor saxophones. E♭ clarinets, alto clarinets, bass clarinets, and baritone saxophones are less common, but can be found in some bands. Bassoons and oboes are very seldom found on a field due to the risk of incidental damage, the impracticality of marching with an exposed double reed, and high sensitivity to weather. The brass section usually includes trumpets or cornets, mellophones or E♭ alto horns (instead of horns), tenor trombones, baritone horns or euphoniums, and Tubas or sousaphones. E♭soprano cornets are sometimes used to supplement or replace the high woodwinds. Some especially large bands use flugelhorns and bass trombones. 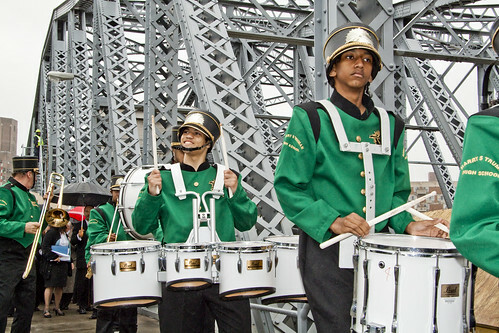 Marching percussion (often referred to as the drumline, battery, or back battery) typically includes snare drums, tenor drums, bass drums, and cymbals and are responsible for keeping tempo for the band. All of these instruments have been adapted for mobile, outdoor use. Marching versions of the glockenspiel (bells), xylophone, and marimba are also rarely used by some ensembles. Historically, the percussion section also employed mounted timpani that featured manual controls. 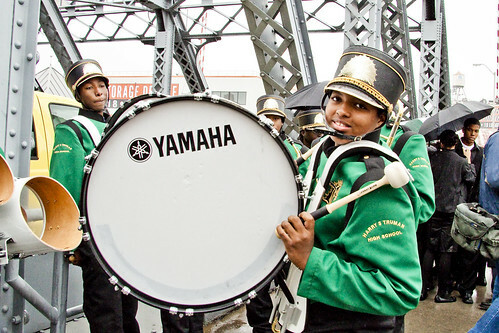 For bands that include a front ensemble (also known as the pit or auxiliary percussion), stationary instrumentation may include orchestral percussion such as timpani, tambourines, maracas, cowbells, congas, wood blocks, marimbas, xylophones, bongos, vibraphones, timbales, claves, guiros, and chimes or tubular bells,concert bass drums, and gongs, as well as a multitude of auxiliary percussion equipment. Drum sets, purpose-built drum racks, and other mounted instruments are also placed here. Until the advent of the pit in the early 1980s, many of these instruments were actually carried on the field by marching percussionists by hand or on mounting brackets. Some bands also include electronic instruments such as synthesizers, electric guitars, and bass guitar, along with the requisite amplification. If double-reed or string instruments are used, they are usually placed here, but even this usage is very rare due to their relative fragility. Unusual percussive instruments are sometimes used, including brake drums, empty propane tanks, trashcans, railroad ties, stomping rigs, and other interesting sounds. Word went around that refreshments could be found, and other entertainments offered, upon our arrival in Deegan Rock Park. Band members also try to keep a constant pace or step size while marching in parade. This usually varies between 22 and 30 inches (56–76 cm) per stride. A step size of 22.5 inches is called 8-to-5 because the marcher covers five yards (about 4.6 m) in eight steps. A step size of 30 inches is called 6-to-5 because five yards are covered in six steps. Because yard lines on an American football field are five yards apart, exact 8-to-5 and 6-to-5 steps are most useful for field shows. 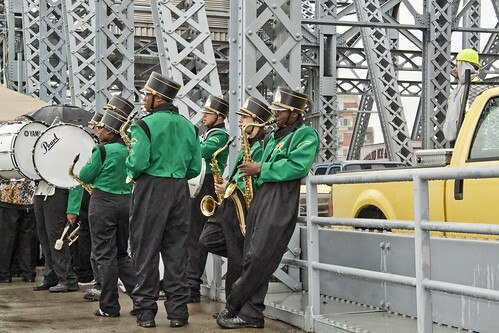 The band played on, as the crowd crossed safely over the flow of Harlem River. A musical instrument is constructed or used for the purpose of making the sounds of music. In principle, anything that produces sound can serve as a musical instrument. The history of musical instruments dates back to the beginnings of human culture. The academic study of musical instruments is called organology. 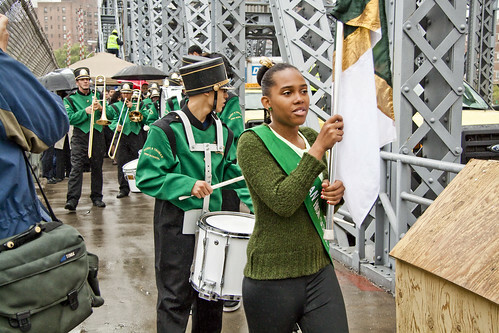 Apparently, the syncopated footsteps of marching bands cause bridge engineers no small amount of worry, but the sturdy old girl didn’t shake a bit. The Bronx is divided by the Bronx River into a hillier section in the west, closer to Manhattan, and the flatter East Bronx, closer to Long Island. The West Bronx was annexed to New York City (then largely confined to Manhattan) in 1874, and the areas east of the Bronx River in 1895. The Bronx first assumed a distinct legal identity when it became a borough of Greater New York in 1898. Bronx County, with the same boundaries as the borough, was separated from New York County (afterwards coextensive with the Borough of Manhattan) as of January 1, 1914. Although the Bronx is the third-most-densely-populated county in the U.S., about a quarter of its area is open space, including Woodlawn Cemetery, Van Cortlandt Park, Pelham Bay Park, the New York Botanical Garden and the Bronx Zoo in the borough’s north and center, on land deliberately reserved in the late 19th century as urban development progressed northwards and eastwards from Manhattan with the building of roads, bridges and railways. Word was that the cake had already been transported down to Deegan Rock Park, and somehow- Diaz knew it. In 1997, the Bronx was designated an All America City by the National Civic League, signifying its comeback from the decline of the 1970s. In 2006, The New York Times reported that “construction cranes have become the borough’s new visual metaphor, replacing the window decals of the 1980s in which pictures of potted plants and drawn curtains were placed in the windows of abandoned buildings.” The borough has experienced substantial new building construction since 2002. Between 2002 and June 2007, 33,687 new units of housing were built or were under way and $4.8 billion has been invested in new housing. In the first six months of 2007 alone total investment in new residential development was $965 million and 5,187 residential units were scheduled to be completed. Much of the new development is springing up in formerly vacant lots across the South Bronx. Other Bronx politicos also eagerly followed the charms of the baked goods. Throughout Bronx Week, residents of the Bronx and visitors from the tri-state region come together to celebrate the people, places, history and businesses of the Bronx. Outdoor performances, trolley tours, health fairs, a salute to volunteers and business workshops are just some of the events in store. The grand finale is on Sunday, May 23rd, when famous sons and daughters of the borough will return home for induction to the Bronx Walk of Fame on the Grand Concourse, followed by our annual Parade, Food & Art Festival and Concert on Mosholu Parkway. Bronx Week is the ideal time to remind all New Yorkers that The Bronx is a great place to live, work and play. Don’t Miss The Fun! The lady who was holding this sign was chided by your humble narrator for hiding her face. 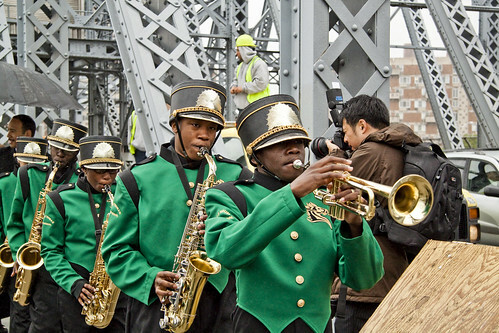 That was the Madison Avenue Bridge Centennial Parade. 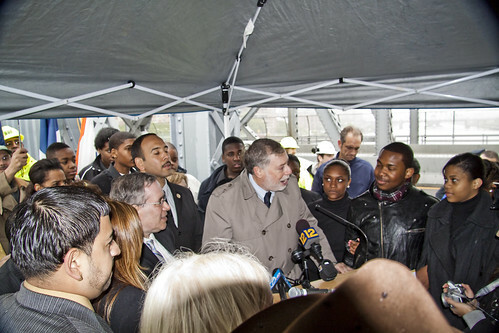 Bronx Week 2010 kicked off yesterday, May 12, but fear not — all you’ve missed so far was a press conference. This year’s festive celebration of the borough will include 22 events in only 12 days and culminate in a busy, exciting Grand Finale on Sunday, May 23. 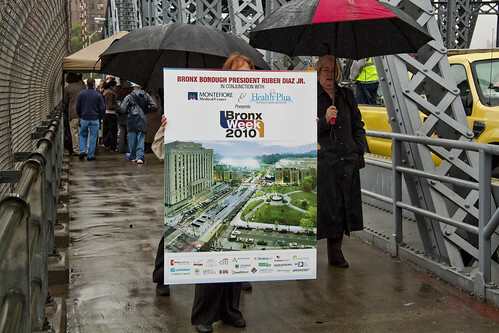 Doris Quiñones, executive director of the Bronx Tourism Council, said that this year, for the first time, Bronx Week has been moved up one month earlier. That day is the Grand Finale, which is the big culmination of Bronx Week. In addition to the parade, which starts at noon on Mosholu Parkway, that night will be the famous Bronx Ball, at which the borough’s best and brightest show up in formal attire to dance the night away. This year the ball is under a huge tent at Orchard Beach at 6 p.m. and, as in the past, will have a red carpet, Bronx high school cheerleaders, and will kick off when Borough President Diaz honors a special few.